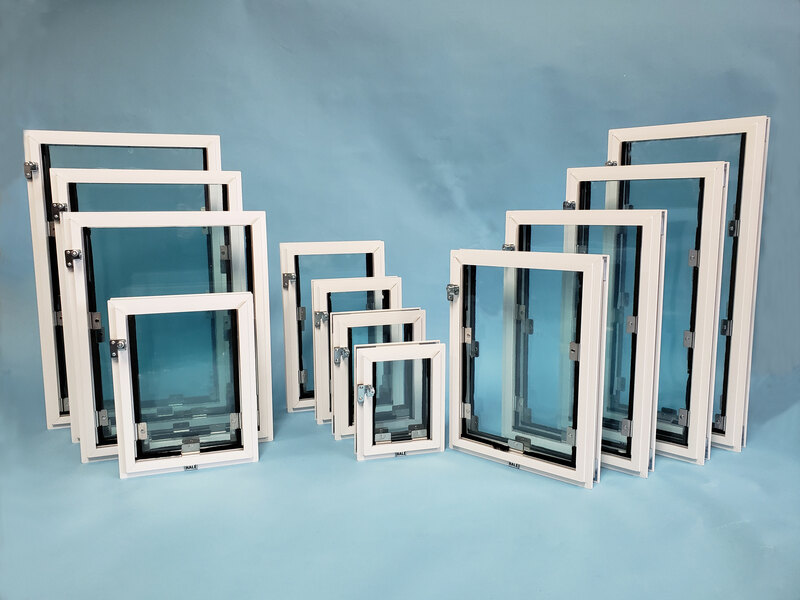 One of the things that sets Hale Pet Door™ apart from its competitors is the wide variety of standard sizes we offer to fit almost any animal and almost any application. Many pet door companies only offer small, medium and large sizes but we have 12 standard sizes that are designed to work with not only the size of your pet but the size of the installation location. We also offer custom made doors of almost any size. For more information on custom sizing pricing and ordering, please follow the link below. We are pleased to be able to provide you with the following information to make choosing the correct pet door easy. If you have limited space for your pet door, you need to take into consideration both the rough opening size (the hole cut into your door, wall, etc. represented in green above) and the tip to tip size (the outermost frame measurement represented in beige above). Using the graphic and chart above as a guideline, measure your available area and see which standard size best fits your situation, keeping in mind the size of your animal (see section below about how to measure your pet). If necessary, we can supply a custom size door made to fit your available area while providing the largest possible passage opening for your pet. If you need to purchase replacement flaps the size listed on the replacement parts page is the approximate passage opening. The actual flap size is a little narrower and a little taller (due to the top metal bar attachment). If you are not sure of your door size, the easiest measurement to take is the tip to tip size. Measure the outermost frame distance as shown in beige in the graphic above. Use the chart above to translate the tip to tip measurement into a door size and order the appropriate size flaps. If you have a custom size pet door or require further assistance, please call us at 800-646-4773. There are three measurements to take into consideration when choosing the correct size door for your pet: 1) the width of the passage opening, 2) the height of the opening, and finally 3) the “rise” or the lip at the bottom of the door that the pet must step over to use the door. Use the following guidelines to ensure a proper fit for your pet. Measurement 1: Width – This is the easy one. Simply measure your pet at the widest point and add an inch or two for safety. If your pet is long haired, don’t forget that this may make them appear wider than they really are. Alternately, you can open a door just wide enough for your pet to pass through and measure the width of the opening, again adding an inch or two for safety. Measurement 2: Height—The pet door flaps should be at least an inch or two above the top of your pet’s back not the head. 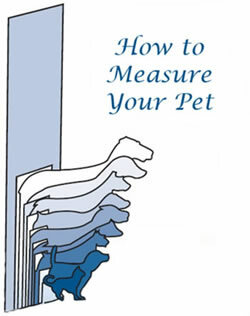 To get this length, measure your pet from the withers (top of the shoulders) to the floor. Remember that your door won’t be placed completely at floor level. Measurement 3: Rise—This measurement is only applicable for panel models which come with the rise built in. Door, wall, screen, and window models can be mounted at whatever height is comfortable for your pet. If you have a short-legged dog or an older dog that can’t lift his feet very high, or if the door is installed with a step on either side, consider ordering a “no rise” door. Our standard rise is 5” or 10”. Alternate method: You can also make a sample door opening out of a large piece of cardboard based on the above size chart. Place it in a door opening and experiment with height placement. Order the size most comfortable for your pet. Older pets don’t like to use pet doors that are uncomfortable. Make sure you get a door that your pet will always be able to use. If you currently have a kitten or puppy, remember that they will grow. Mount the pet door so that it is low enough for your pet to comfortably step over. Young pets can raise their legs up to their chest but older pets may have trouble with this. Make sure the pet door is tall enough for your pet. Hunching over can be hard on your pet’s hips, especially as they age. And the flaps on your door will last longer if your pet isn’t rubbing against the top of the door as he passes through. If you have more than one pet, make sure you get a door that will work for all of them: low enough for the shortest one to step over but tall enough for the tallest one to fit through comfortably. Don’t forget that your pet needs access from both sides of your pet door. If you are installing the door in an area that has steps outside, please take into consideration how your pet will have to get through the door. This is especially true of our panel models. They have a standard rise of 5” but can be ordered with no rise (actually about 1” of frame to step over) instead to make it easier for your pet. For more sizing suggestions, please see our breeds page. If you need a custom sized door, please see our custom orders page. © Hale Pet Door - Designed by Dolphin Micro Inc.